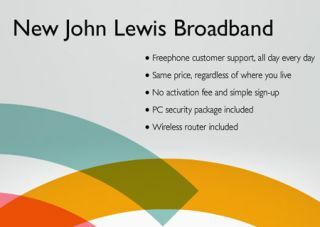 John Lewis launches its own-name broadband service | What Hi-Fi? John Lewis has re-branded its broadband service under its own name and is offering a standard 'up to 16Mb' package for £11 a month with a limited 20GB monthly usage. Unlimited monthly usage for the 16Mb service will cost you £18/month. If you want faster, fibre optic broadband, John Lewis will offer you a 38Mb package with 100GB monthly limit for £25 a month. Phone line rental and calls are available from £13.50 per month. Prices are standard wherever you live in the UK, there's no activation fee and a wireless router and PC security package are included as standard. Existing Waitrose and Greenbee broadband customers can upgrade to the new service. Their existing services will be phased out once they've switched to John Lewis broadband. Full details of the various packages avaialble on the John Lewis website.